Gulf airline Emirates has announced it has spent US$500 million in “long-term investment” in its fine wine programme over the last decade. The carrier has said it been buying wines en primeur and keeping them up to a decade before they are ready to be consumed in a cellar it owns in Burgundy – which apparently holds 1.2m bottles already. 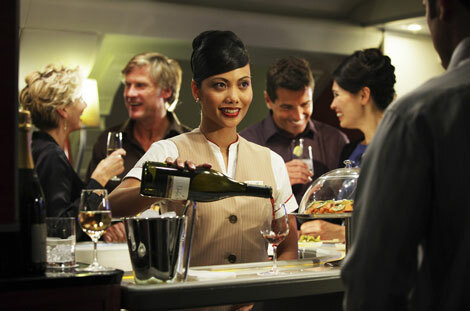 President of the airline, Sir Tim Clark, said: “To us, wine is an experience. Our customers want to enjoy wine onboard as if they were in a fine dining restaurant. It’s not just red, white, or rosé. They are interested in where the grape comes from, the vintage, the vineyard’s heritage and so on. That is why over a decade ago, we moved away from the usual corporate procurement process and decided to take control of our own destiny. “We could have taken the easy way out – just do the maths for how many bottles we’d need in each cabin class over a year, then put it up for tender. But with the scale of our operations, this would limit our choices as not many producers can offer the quantities we’d need, at the quality standards that we’d want. For example, first class passengers flying between San Francisco and Houston on Emirates’ A380 services (for a “limited time”) will be able to enjoy Dom Pérignon 2003 Rosé, as well as vintages from each of the first growths of Bordeaux. Meanwhile, passengers flying from London Heathrow to Hong Kong International in first class can choose from Dom Pérignon 2004, August Kessler’s 2013 Lorchhauser Seligmacher Riesling, 2004 Léoville Las Cases, 2005 Château Guiraud and Graham’s 1976 tawny Port. Business class passengers can sip Veuve Clicquot’s yellow label, G de Guiraud’s 2013 and Red Claw Chardonnay 2013 from Mornington Peninsula. Wines being served on all routes can be checked here but other highlights include 1998 Pontet Canet and De Wetshof’s 2011 Bateleur Chardonnay served between Paris and Dubai; 2001 Gruaud Larose and 2006 Pagodes de Cos from Dubai to Tokyo; 2010 Mount Eden Vineyards Chardonnay and Sassoalloro Oro 2006 by Jacopo Biondi Santi between JFK and Bangkok and 2005 Penfolds Grange on flights between Dubai and Emirates’ Australian and New Zealand destinations.